Despite the fact they're not the most popular vehicles at the moment, there's still a sizeable demand for subcompact and compact cars, and rightly so. Even if you love them, an F-450 pickup truck isn't really a practical option for the daily commute if you live in an apartment in the city, and that's where small cars really come into their own. But to survive in a market heavily dominated by trucks, crossovers and muscle cars, compacts and subcompacts have to be good; very good, actually. So here we take a look at two of the best to see which is better in a head-to-head comparison of the 2017 Ford Fiesta vs. 2017 Honda Fit. The Honda Fit has only recently been redesigned while the Fiesta has been around in its current form for some time now, but you wouldn't know it to look at them. To be fair to the Honda, it does have a modern exterior design and it's easy to see the improvements over its predecessor. The problem is that despite it looking very contemporary, it just isn't particularly good looking. The Fit does have a lot going for it, but its looks are not its strongest point by a long way and the exterior styling is something you're more likely to put up with than love. There's a trump card held by the Fiesta right from the start as far as exteriors are concerned as the Ford is available in both sedan and hatchback formats. The look of both body styles is bold, modern and exciting, and it makes you want to find out more as soon as you see it. If you didn't know any better you could easily assume the Fiesta's design is as recent as that of the Fit. If you want contemporary and sensible the Fiesta has it covered, but if you want overtly sporty the ST has that covered too. We'd normally expect a new generation of a small car to be even just a little faster and more nimble than the model it replaces, but that's not the case here with the 2017 Honda Fit. It is more comfortable and more refined than its predecessor, but this isn't a large sedan you're likely to be doing regular interstate journeys in, so it's questionable if that's the right way to go with a compact. The Honda's 1.5-liter inline-four engine develops a useful 130 horsepower and 114 lb.-ft. of torque, but although a pretty impressive and responsive six-speed manual transmission is standard, most models you're likely to see on dealer lots will have the CVT that sacrifices some driver engagement for better fuel economy. Even the most basic versions of the 2017 Ford Fiesta are great fun to drive, and as you climb up through the trims things just get better and better. Unlike the Honda, the Fiesta offers three different engine choices instead of adopting the take-it-or-leave-it approach of Honda with the Fit's single powerplant. The standard engine is a 1.6-liter inline four producing 120 horsepower and 112 lb.-ft. of torque, while the optional engine for most models is the sensational 1.0-liter three-cylinder EcoBoost that gets you an impressive 123 horsepower and 125 lb.-ft. If that's not enough for you there's also the performance orientated ST models with a 1.6-liter EcoBoost producing 197 horsepower and 202 lb.-ft. Add into the mix the Fiesta's beautifully weighted steering and sensational chassis, and it's a huge winner over the Fit in the performance stakes. Honda isn't renowned for how cheap its vehicles are, but the Fit delivers a good degree of quality for what you're asked to pay for it. Although quality is important, we also like to get plenty of goodies in our cars these days and there's a bit of a problem here for the Fit. The standard levels of features and equipment are ok, but if you want to upgrade you really have to go to the next trim level. A big list of available options can be confusing and expensive at times, but at least a little more choice wouldn't go amiss. By way of contrast, there are four trim levels of Fiesta instead of the three offered for the Fit, three different engines and a whole host of upgrade packages to build the Fiesta that's right for you. 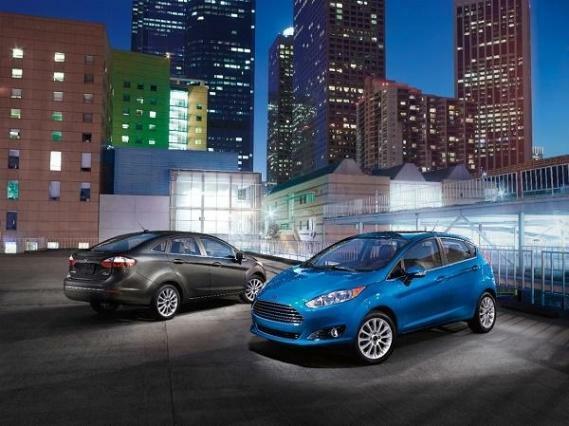 When you then consider how the 2017 Ford Fiesta is less expensive to buy throughout the trim levels when comparing like for like with the 2017 Honda Fit, it's easy to see where the best value for money lies. There's nothing inherently wrong with the 2017 Honda Fit as it's actually a very good car indeed. Its problem is that it just falls short in so many areas when compared directly to the 2017 Ford Fiesta. Whether it's styling, performance, fuel economy or value for money you are considering, there's a model in the Fiesta lineup that's better than a Fit. For a car that's probably in the last model year of its current generation going up against a rival so recently redesigned as the Honda Fit, that's quite an achievement.